Changsha (ရိုးရှင်းတရုတ်: 长沙; ရိုးရာတရုတ်: 長沙; ပင်ရင်: Chángshā; Wade–Giles: Chang-sha) is the capital city of Hunan, in south-central China, located on the lower reaches of Xiang river, a branch of the Yangtze River. Its municipality covers an area of 11,819 sq. kilometers and, according to the 2010 Census, a population of 7,044,118 inhabitants. Changsha was important from the time of the Qin dynasty (221–207 BC). In AD 750–1100 Changsha was an important commercial city, and its population increased greatly. Under the Qing dynasty, from 1664, it was the capital of Hunan province, and it was a major rice market. It was besieged during the Taiping Rebellion but never fell. Changsha was the site of Mao Zedong's conversion to communism. It was the scene of major battles in the Sino-Japanese War of 1937–45 and was briefly occupied by the Japanese. Rebuilt since 1949, the city is now a major interior port and a commercial and industrial center. The origins of the name "Changsha" are lost in antiquity. The name first appears in the 11th century BC, during the reign of King Cheng of the Zhou dynasty, a vassal lord from the Changsha area sent a type of softshell turtle known as "Changsha softshell turtle" (တရုတ်: 长沙鼈) as tribute to the Zhou king. In the 2nd century AD, historian Ying Shao wrote that the Qin dynasty use of the name Changsha for the area was a continuance of its old name. ဟန်ခေတ်(ဘီစီ ၂၀၆-အေဒီ ၂၂၀)မှစ၍ လင်ရှန်ခရိုင်ဟု အမည်တွင်ပြီး ချန်ဆားတိုင်း ရုံးစိုက်ရာမြို့ ဖြစ်ခဲ့သည်။ အေဒီ ၅၈၉ တွင် တန်ဒေသ၏ရုံးစိုက်ရာဖြစ်ခဲ့ပြီး ချန်ဆားမြို့ဟု ပြောင်းလဲမှည့်ခေါ်ခဲ့သည်။ It lost some importance at this period, however, because traffic from Guangdong was mostly diverted up the Gan River valley in Jiangxi. ခမ်းနားစွာစီမံထားသော ဟန်မင်းဆက်၊ မာဝမ်တွေ့(Mawangdui) အုတ်ဂူများအား ဘီစီ ၁၈၆ နှင့် ၁၆၅ ကြားကာလများတွင် ဆောက်လုပ်ခဲ့သည်။ အစောဆုံးအုတ်ဂူဖြစ်သည့် ဂူအမှတ်-၂ ကို ၁၉၇၀တွင် တူးဖော်ခဲ့ရာ ရှင်ကြွေ(Xin Zhui)အမည်ရှိ အမျိုးသမီး၏အလောင်းကို အံ့ဩဖွယ် ကောင်းမွန်သောအနေအထားဖြင့် တွေ့မြင်ရသည်။ ဂူအတွင်းတွင် တောက်တယ်ကျင်း (Dao De Jing) (道德经)ခေါ် တာအိုဝါဒဆိုင်ရာ ရှေးဟောင်းကျမ်းစာတစ်စောင်ကိုလည်း အခြားသမိုင်းဝင်ပစ္စည်းများကြားတွင် တွေ့ခဲ့ရသည်။ သုံးပြည်ထောင်ခေတ်တွင် ချန်ဆားမြို့သည် Changsha was a much-fought-over territory. During the Sui Dynasty, Changsha was a county and under the Tang it was known as Tanzhou. တန်မင်းဆက် (အေဒီ ၆၁၈-၉၀၇) ပျက်သုန်းပြီးနောက် ချန်ဆားမြို့သည် လွတ်လပ်သော ချူနိုင်ငံ၏မြို့တော် ဖြစ်ခဲ့သည်။ ထို့နောက် တန်မင်းဆက်(အေဒီ ၉၂၃-၉၃၇) လက်အောက်သို့ ကျရောက်ခဲ့သည်။ အေဒီ ၇၅၀နှင့် ၁၁၀၀ ကြားကာလများတွင် ချန်ဆားသည် ကူးသန်းရောင်းဝယ်ရေးမြို့တော်ဖြစ်ခဲ့ပြီး လူဦးရေလည်း ဆယ်ဆခန့် တိုးတက်လာခဲ့သည်။ မင် (၁၃၆၈-၁၆၄၄)နှင့် ချင်မင်းဆက်(၁၆၄၄-၁၉၁၁/၁၂)လက်ထက်များတွင် ချန်ဆားသည် it was made a superior prefecture and from 1664 onward was the capital of Hunan and prospered as one of China's chief rice markets. During the Taiping Rebellion the city was besieged by the rebels (1854) but never fell; it then became the principal base for the suppression of the rebellion. Changsha was opened to foreign trade in 1904. Further development followed the opening of the railway to Hankou in Hubei province in 1918, which was extended to Guangzhou in Guangdong province in 1936. Although Changsha's population grew, the city remained primarily commercial in character and before 1937 had little industry, apart from some small cotton-textile, glass, and nonferrous-metal plants and handicraft enterprises. Yuelu Academy (岳麓书院) was founded in AD 976 (Song Dynasty), destroyed by war in 1127, and rebuilt in 1165 (Southern Song Dynasty). The celebrated philosopher Zhu Xi (朱熹) taught at the Academy in 1165. It was destroyed by the Mongols but was restored in the late 15th century (Ming Dynasty). In 1903 it became Hunan High School. The modern day Hunan University is a descendant of the academy. The architecture of some of the buildings was restored from 1981–1986, presumably according to the Song design. The 1903 Treaty of Shanghai between the Qing Dynasty and Japan opened the city to foreign trade. Consequently, factories, churches and schools were built. A college was started by Yale University bachelors, and later became a medical center named Xiangya and a secondary school named the Yali School. Till May 1927, communist support remained strong in Changsha before the massacre carried out by the right-wing faction of the KMT troops owing allegiance to Chiang Kai-shek in its offensive against the left-wing faction of Wang Jingwei then allied closely with the communists. The purge of communists and suspected communists was part of Chiang's plans to consolidate his hold over the KMT weakening Wang's control, and thereby over entire China eventually. In a period of twenty days, Chiang's forces killed more than ten thousand people in Changsha and its outskirts. During the Second Sino-Japanese War (1937–45), the strategic location of Changsha made it the focus of four campaigns by the Japanese to capture it from the hands of the Chinese Nationalists which resulted in the battles of 1st Changsha, 2nd Changsha, 3rd Changsha, and 4th Changsha. The city was able to repulse the first three attacks thanks to Xue Yue's leadership, but ultimately fell for a short time into Japanese hands in 1944 for another year until they were defeated in a counterattack and forced to surrender. The city itself was virtually destroyed by fire in 1938–39. The city later became the territory of the People's Republic of China when it was formed in 1949 after the Kuomintang were driven to Taiwan. Changsha is located between 111° 53'–114° 5' E longitude and 27° 51'–28° 40' N latitude, situated in east central Hunan. Its terrain is high in the west and low in the east. There are many mountainous areas in the west and in the north. The Xiang River flows south to northwest; 296 m high Mt. Yuelushan is in the west; and Liuyanghe River (Liuyang River) and Laodaohe River (Laodao River) east. Changsha experiences a humid subtropical climate (Köppen Cfa), with annual average temperature being ၁၇.၀ ဒီဂရီ စင်တီဂရိတ် (၆၂.၆ ဒီဂရီ ဖာရင်ဟိုက်), with a mean of ၄.၆ ဒီဂရီ စင်တီဂရိတ် (၄၀.၃ ဒီဂရီ ဖာရင်ဟိုက်) in January and ၂၉.၀ ဒီဂရီ စင်တီဂရိတ် (၈၄.၂ ဒီဂရီ ဖာရင်ဟိုက်) in July. Average annual precipitation is ၁,၃၃၀ မီလီမီတာ (၅၂ လက်မ), and the yearly frost-free period is 275 days. The four seasons are distinct. The summers are long and hot, with heavy rainfall, and autumn is comfortable with abundant sunlight. Winter is comparatively dry (but somewhat damp and overcast) and rather brief, but cold snaps occur with temperatures occasionally dropping below freezing. Changsha neighboring areas include: Jiangxi province, cities and counties of Hunan, such as Tonggu County, Wanzai County, Yichun City, Pingxiang City of Jiangxi province. 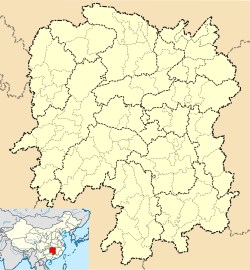 Pingjiang County, Miluo city, Xiangyin County of Yueyang; Heshan District, Taojiang County, Anhua County of Yiyang; Lianyuan city of Loudi; Zhuzhou County, Liling City of Zhuzhou; Xiangtan County, Xiangxiang city of Xiangtan. Changsha Metro is planning a 6 line network. The first two lines under construction are planned to open in 2015. Line 1 will run from north to south and Line 2 from west to east. National Highways 107 and 319, as well as Changsha-Zhuzhou-Xiangtan Express Way connect the Changsha metro area nationally. There are three main bus terminals in Changsha: South Station, East Station and West Station, dispatching long- and short-haul trips to cities within and outside Hunan Province. Changsha is surrounded by major rivers, including the Xiangjiang, the Liuyanghe, and the Laodaohe. Ships transport mainly goods from Xianing port located in North Changsha domestically and internationally. ချန်ဆားဘူတာကြီး သည် မြို့လယ်ခေါင်တွင်တည်ရှိပြီး အခြားမြို့ကြီးများနှင့်အမြန်ရထားများ၊ ရိုးရိုးရထားခရီးစဉ်များပြေးဆွဲလျက်ရှိသည်။ . ချန်ဆားတောင်ပိုင်းဘူတာကြီး သည် ကျည်ဆံရထားများပြေးဆွဲသည့် ဘူတာကြီးဖြစ်သည်။ The Wuhan–Guangzhou High-Speed Railway (part of the planned Beijing -> Hong Kong high speed rail) stops here. The Shanghai-Changsha-Kunming high-speed railway is currently under construction. Changsha Huanghua International Airport is a regional hub for China Southern Airlines, which serves major cities in China, including Hong Kong. Other major airlines also provide daily service between Changsha and other domestic and international destinations.The airport provides direct flights to 45 major cities such as HongKong, Bangkok, Seoul, Pusan, Osaka and etc. In 2011 the airport handled 13,810,000 people. Changsha's population nearly tripled between the start of its rebuilding in 1949 and the early 1980s. The city is now a major port, handling rice, cotton, timber, and livestock, and is also a collection and distribution point on the railway from Hankou to Guangzhou. It is a centre of rice milling and also has oil-extraction, tea- and tobacco-curing, and meat-processing plants. Its textile industry produces cotton yarn and fabrics and engages in dyeing and printing. Agricultural chemicals and fertilizers, farm implements, and pumping machinery are also produced. ချန်ဆားမြို့တွင် ဓာတ်အားစနစ်နှင့်ချိတ်ဆက်ထားသော အပူသုံးဓာတ်အားပေးစက်ရုံကြီးရှိပြီး အနီးရှိ ကျူကျိုးစက်မှုဇုံနှင့် ရှန်ထန်စက်မှုဇုံများသို့ ဓာတ်အားပေးလျက်ရှိသည်။ the three cities were designated in the 1970s as the nucleus of a major industrial complex. In the 1960s there was some development of heavy industry. The manufacture of machinery, especially machine tools and precision tools, became important, and Changsha became a center of China's aluminum industry. The city also has cement, rubber, ceramic, and papermaking plants and is a centre for many types of traditional handicrafts, producing hsiang embroidery, leather goods, umbrellas, and buttons. Coal is mined in the vicinity. ချန်ဆားသည် တရုတ်နိုင်ငံ၏ စီးပွားရေးထိပ်တန်းမြို့ကြီး ၂၀ တွင် တစ်ခုအပါအဝင်ဖြစ်သည်။ ၂၀၀၈ တွင် ချန်ဆား၏ ဂျီဒီပီမှာ ¥၃၀၀.၁ ဘီလျံ(US$၄၃ဘီလျံ)ရှိခဲ့ပြီး တစ်နှစ်ထက်တစ်နှစ်တိုးတက်မှုမှာ ၁၅.၁%ဖြစ်သည်။ Its per capita GDP was ¥45,765 (US$6,589). Its GDP grew at an average of 14% per year from 2001 to 2005, compared to the national average of 9% in the period. As of 2005, the service sector generated roughly around 49% Changsha's GDP, up 112% from 2001 figures, and it is expected to continue driving the city's economic growth. Leading to a disposable income for urban residents of 12,343 RMB annually. The manufacturing and construction sectors have grown relatively steadily, growing 116% during 2001-2005. The primary sector, including agriculture, forestry, animal husbandry, and fishery, has grown slightly over this same period. In addition, the consumer market has grown dramatically with income levels. With a minimum salary level of 600 RMB per month in comparison to Beijing 640 RMB or Shanghai at 750 RMB per month. Urban residents in 2005 had average income of about USD 1,500, 15% higher than national average, and up 10% from 2001 figures. Changsha has attracted a substantial level of foreign investment. In 2005, for example, nearly USD 1 billion worth of foreign direct investment (FDI) poured into the city, mainly in hi-tech, manufacturing, food production, and services. This figure is up 40% from 2001. 59% of the total FDI has come from Hong Kong, South Korea, Singapore, and Japan; 28% has come from the Americas and 9% from Europe. By the end of 2008 more than 500 foreign companies had made over USD 10 million worth of investments in Changsha. Changsha had total retail sales of 74 RMB billion in 2006. Rapid economic growth has made environmental pollution a serious problem in Changsha, caused by rapidly increasing numbers of private cars, widespread construction sites, and numerous industrial facilities on the outskirts of the city. Broad Sustainable Building company (that owning the technology of rapid construction of buildings) intends to build in Changsha at few months in 2013 the Sky City, new world's tallest skyscraper having 838 meters height and 220 floors. The Changsha National Economic and Technology Development Zone was founded in 1992. It is located east of Changsha. The total planned area is 38.6sqkm and the current area is 14sqkm. Near the zone is National Highways G319 and G107 as well as Jingzhu Highway. Besides that, it is very close to the downtown and the railway station. The distance between the zone and the airport is 8 km. The major industries in the zone include high-tech industry, biology project technology and new material industry. Changsha is home to the Lei Feng Memorial (雷锋纪念馆) and statue. In May 2008, the BBC broadcast, as part of its Storyville documentary series, the four-part The Biggest Chinese Restaurant in the World, explores the inner workings of the 5000-seat capacity West Lake Restaurant (Xihu Lou Jiujia) located in Changsha. Changhsa has one of China's largest multi-purpose Helong Stadium for 55,000 people. Changsha was represented by the star Zeta Corvi in a Chinese constellation. ↑ Zhongguo gujin diming dacidian 中国古今地名大词典 [Dictionary of Chinese Place-names Ancient and Modern] (Shanghai: Shanghai cishu chubanshe, 2005), 505. ↑ China Briefing. China Briefing. Retrieved on 2011-08-28. ↑ China Briefing Changsha Report. China-briefing.com. Retrieved on 2011-08-28. ↑ cs_report60_enw.indd. (PDF) . Retrieved on 2011-08-28. ↑ Changsha Economic Data and News. The China Perspective. Retrieved on 2011-08-28. ↑ China Business News. China-Briefing. Retrieved on 2011-08-28. ↑ Changsha National Economic and Technology Development Zone. RightSite.asia. Retrieved on 2011-08-28. ↑ Yeulu Academy, Changsha. Dm.hnu.cn. Retrieved on 2011-08-28. ↑ Star Name - R.H. Allen p.182. Penelope.uchicago.edu. Retrieved on 2011-08-28.